This large 3 cubic foot insert features clean burning Hybrid-Fyre Technology. Hybrid Technology is a fusion of advanced secondary combustion with the addition of catalytic assist technology. Primary combustion burn occurs in the firebox with our secondary tubes re-burning gases before they leave the firebox, any remaining unburned gases then through a catalytic combustor leaving virtually no smoke to exit the appliance. The net result of this is a super clean burning insert, with emissions of just .58 grams per hour. Also with that reduction in emissions comes almost zero carbon mononxide. We are taking clean burning to an unmatched level of efficiency. Our overall efficiency for this Large Flush Wood Hybrid-Fyre Insert is over 80%. What this means is more heat from less wood, and greater savings on your heating cost! This insert will heat up to 2,500 sq. feet, with up to 10 hour burn times and can accept 24" wood. The Large Flush Wood Hybrid-Fyre Insert features a huge 319 sq. in. 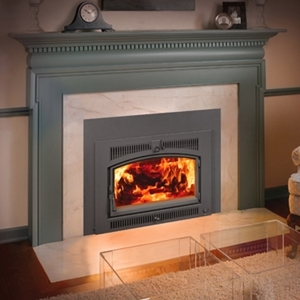 fire-viewing area, twin 90 CFM convection fans and has the option of adding the Revolutionary GreenStart Option. GreenStart is a patent-pending ignition system for the modern wood burner; just load your wood and push a button!